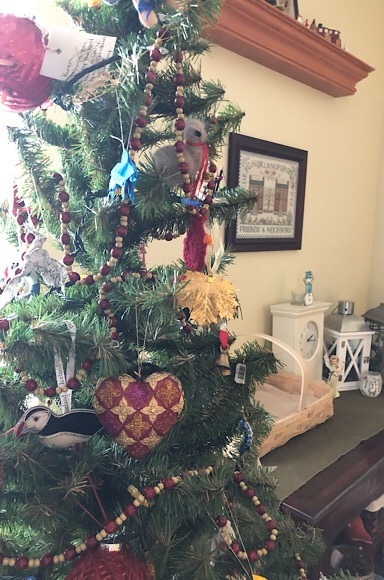 I've decorated the main floor of my house on a smaller scale, yet this smaller scale took me just as long because I had to go through all the boxes of Christmas stuff to find 'the best of' items. I'm pleased with the results. 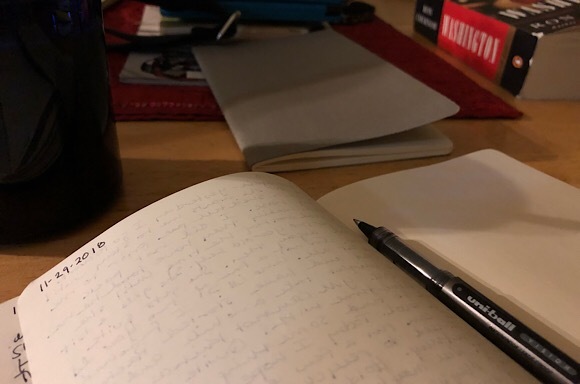 Each morning, I sit and write in my journal while shooing the cat away from the tree. She is persistent. Holly at times is quite respectful of the tree and acts like an angel. Then she will do a dive bomb into the tree. She loves the tree and frequently risks safety and walks by the sleeping dog to gaze upon its beauty. She knows a good thing when she sees it. 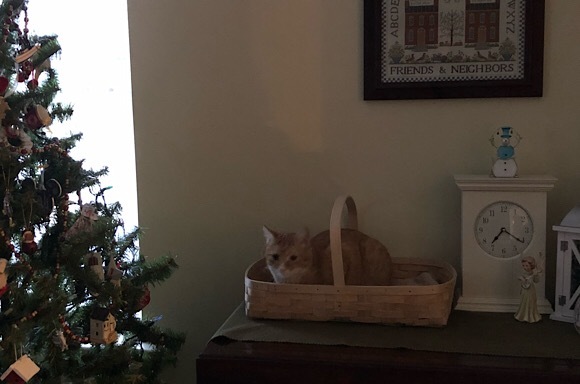 In hopes of curbing her dive bombing skills, I placed a basket next to the tree for some cat napping. I think she likes it. Our cat-dog drama has hit a stride of almost harmony. Almost. On December 9th she will be here one whole year. I cannot imagine the house without her (well I can imagine the quietness of the house without her). She is gentle, shy and oh so sweet. Frodo in turn has become youthful and energetic now that he has someone to chase. In knitting news, I'm on the last gift cowl. I say this with reservations because I would like to knit one for my husband, maybe. Next week, I will start something for me. All of this knitting for others is creating a frenzy of casting on thoughts all for me. I daydream of a cowl! a hat! another cowl! 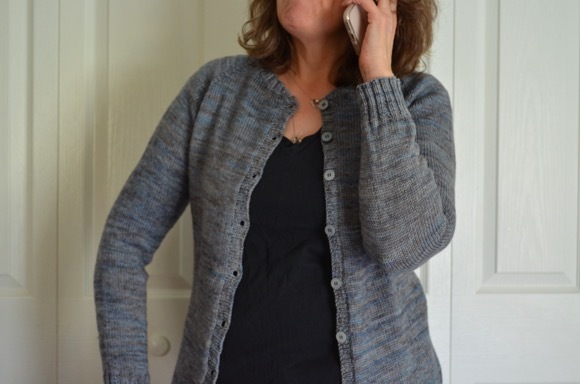 and I am planning a yoke sweater cast on December 25th. I know that Santa bought me some yarn for that Christmas day sweater. I already bought the pattern(s). Maybe there will be two sweaters? See - I told you it's a frenzy of thoughts. I love this time of year and the cold weather that inspires lots of woolen knits. Advent starts tomorrow, I want to be mindful, grateful and focused on enjoying the season. I'm lucky in that I exchange most of our gifts to extended family before December first. In December, I focus on my children and friends. How is your holiday planning coming along? This post is full of calm, Karen. Beautiful pictures, as always! I am trying not to feel anxious this Advent season... and spend time in anticipation, and learning some patience in the art of waiting! I know that daydreaming well! 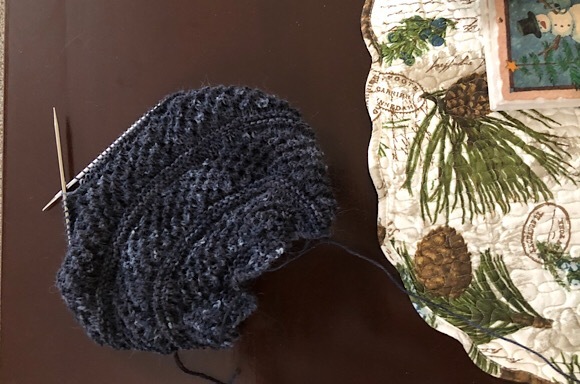 It's only right that you knit for yourself after the months of gift knitting for others, and planning and daydreaming for that is part of the enjoyment. I'm looking forward to seeing what you make! Smart move to give Holly a place to curl up and watch the tree. 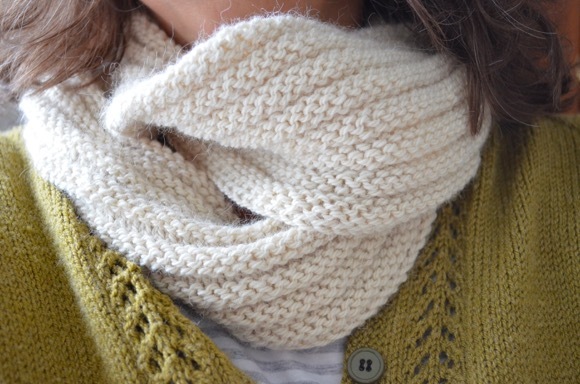 How wonderful the end of gift knitting is insight and you have plans for self-knitting! Even if you go for one more gift your dreams will pay off and you'll be set to go onto projects for yourself. I just dream of knitting. On Curacao my hands started hurting again, so I haven't done any knitting after that. Now where back in Holland and I hope I can at least knit some hats. But I'm not (yet) planning christmas gifts. take very good care of your hands!! You have done well with giving Holly her own little place. She looks quite content there. We are still decorating....like you, all our boxes need to be gone through so I can simplify the decor and use only the best. Your knitting has really taken off and you are almost done. Soon it will be time for your 'self' knitting to begin. How nice that will be. Enjoy Advent. I love Advent and Lent. The preparation of the high Holy Days really makes the actual Christmas and Easter so much more exciting! I can't believe you've had Holly for almost a year!! I bet she loves her basket by the tree - try to get a shot of her if you can. I love to daydream about knitting to come - it's definitely a pleasure. plus in my daydreams I'm able to knit things that I'm not really ready for in real life - lol. Happy December - enjoy the weekend! Hard to believe that it has been a year. Holly is so lucky to have found you. She's such a beautiful girl. I hope Santa leaves HER a little treat under the tree too, but ONLY if she is a good kitty. Ooh, this last photo is of beautiful yarn. You definitely should think of yourself! I was entertained reading about Holly and her antics. I'm glad Frodo is having fun having a feline sister. I used to shop all the time online for myself but my body's built differently so I have to try everything on in person, even shoes. Buying for others online is easier. Great minds think alike. I am knitting a three color cashmere cowl out of scraps for myself. Your yarn is very pretty. 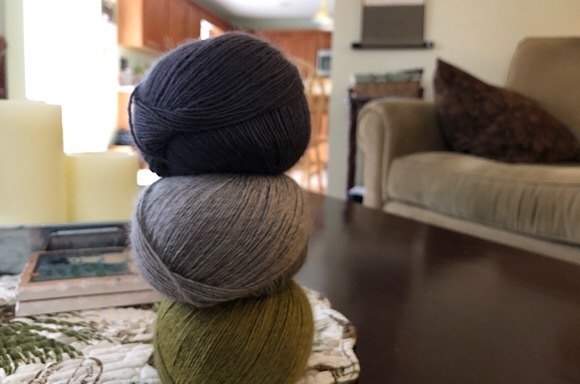 I had a few skeins out on the coffee table while I finished up Norah's stocking and my sis's shawl. Daydreams to keep me going. Since wintry mix is headed our way this weekend my goal is to run around with a dust cloth and put out a few holiday decorations. Your post is very inspiring. Like you I have downscaled the decor, but it took twice as long as I had to sort through all the boxes. Where does the time go, it doesn't seem like a year since Holly arrived? Aw Holly in the basket. I love it. You know how to think like a cat! Very important. We have yet to put ours up. Probably in one more week. We have the outdoor trees lit, and I cannot tell you how gloomy it look s outside right now. Id just as soon it be dark. Or snowing honestly. That looks like a Dewberry. Is it? Even though today is the first day of Hanukkah, I won't really celebrate until late December when my daughter comes home for winter break. I think it makes sense to keep the holiday as stress-free as possible, so going ahead and downscale! Well you were correct on the designer but it's her starshower pattern. I'd say you've got a good eye! !